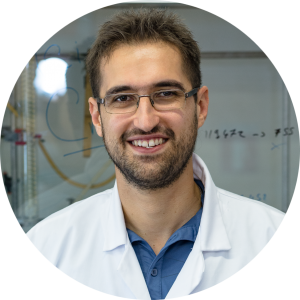 Lubomir Vezenkov performed a co-tutoring PhD between the universities of Montpellier and Naples, under the supervision of Prof. Jean Martinez and Prof. Ettore Benedetti, which he graduated from in 2011. Afterwards he did a two-years-long post-doctoral internship in the prof. Robert Young group in Simon Fraser University, Vancouver, working on the development of selective inhibitors of the autophagy. In 2013 he moved back to Montpellier to perform a post-doctoral study under the supervision of Dr. Muriel Amblard and in 2016 he received an assistant professor position at The National Graduate School of Chemistry of Montpellier (ENSCM). 2) Martin, B. Legrand, L. L. Vezenkov, G. Subra, M. Calmès, J. Bantignies, J. Martinez, M. Amblard; Turning Peptide Sequences into Ribbon Foldamers by a Straightforward Multicyclization Reaction. Angew. Chem. Int. Ed. 2015 Nov 16;54(47):13966-70. doi: 10.1002/anie.201506955.